So glad that Friday is here! I have definitely jumped full forced ahead into 2015, and am desperately missing my pj's and naps from my time off over the holidays. Both of which I plan on enjoying this weekend! Here is a look back at a few highlights from my week. 1. 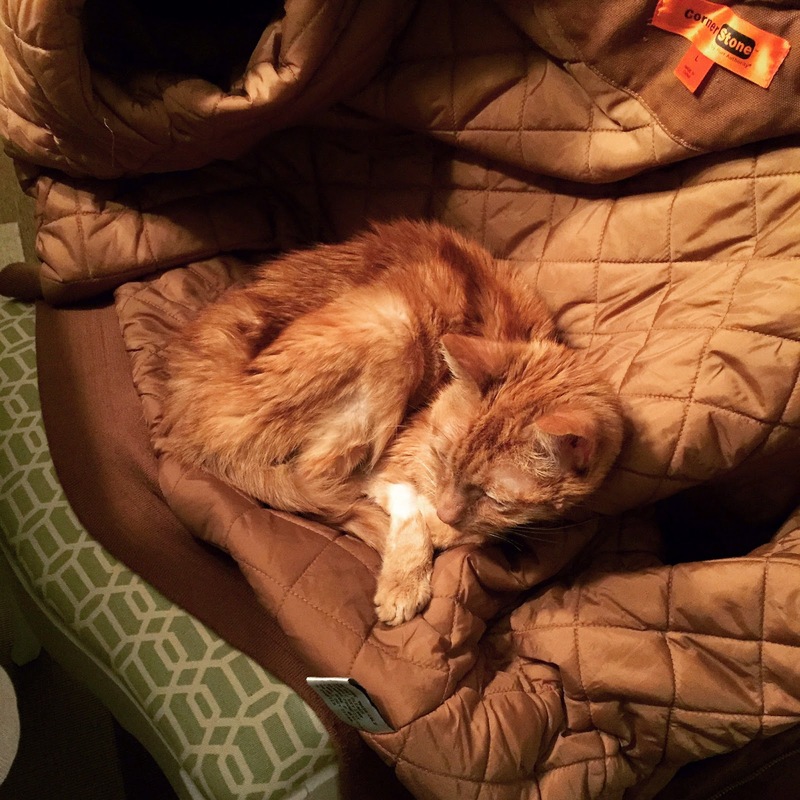 Martin left one of his jackets over our dining room chair and I almost didn't spot Charlie sleeping on it. He has been there nearly all week. Whenever I don't see him around, I just check out that chair, and there he is, camouflaged right in. 2. Though I'm so pretty much over the cold already, I'm a firm believer that if it's going to be cold out, it at least better be white. It's much more pretty then cold and brown. This was my view out of my office window while I was blogging one morning this week, it was just kinda perfect. 3. I have been craving pastels lately, so this week I went with this light candy pink for my nails. I love my Red Carpet Manicure, and am so glad I've learned how to do a nice gel manicure on myself, such a $$ saver. 4. Another thing I'm loving lately, that also happens to fall into the pastels category is my new Kate Spade bracelet that I got for Christmas. I love that is has a secret message on the inside, something that you can carry with you. 5. Martin and I are going out on a double date Saturday night to a hibachi restaurant. Not only are hibachi restaurants always super fun, I'm looking forward to it because we haven't been out with these friends in a while and it's always nice to get together. Whatever your weekend brings I hope it includes some rest and relaxation, preferably in the form of really comfy pj's and naps, at least in my case! Happy weekend! A weekend packed with pjs, naps and a double date sounds PERFECT! I love love love that bracelet. I can't even polish my own nails with normal polish (well, I technically CAN...but it looks like a pre-schooler did it for me), so I'm guessing the whole gel process would be an epic fail for me too. Although, I can't help but think of how much time and money it would save to do it myself! My dog does the same as your cat, only with a white blanket we have (and he's white) so he blends in perfectly. It's the blanket my husband uses so when he was gone, my pup was constantly snuggled in it! Love your Kate Spade bracelet!! Love your bracelet! I love hibachi restaurants too, so fun :) Enjoy your weekend! Love the bracelet! Reminds me a lot of my mantra band! Have fun at the hibachi place, always so much food and so much fun!! Hooray for winter pastels! You know I'm a fan. 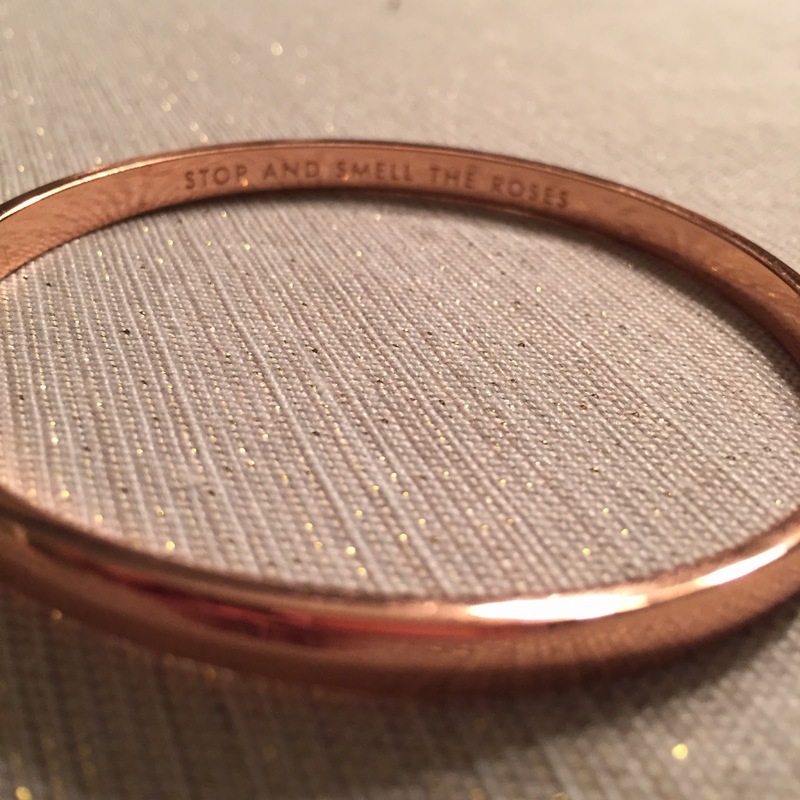 I also can't get enough of my Kate Spade idiom bangle - I may have to add the rose gold one to my collection! Hope you had a good weekend - happy Monday! Gotta love our pets! Hope you had a great weekend! Isn't that so funny how we spend so long searching for them and here they are just chilling all along, if they only knew the panic it caused! Hope your weekend was great! Thanks! The hibachi restaurant was great, hope you're enjoying your time with your family! That's what I thought when I saw your mantra band. Hibachi was so good, so much food - and I totally ate it all! I love those bangles, I want to add the gold one! I think I'm channeling spring through those pastels! Hope your weekend was great! Love that Kate Spade bracelet!!! I've been seeing those stamped bracelets everywhere - love them! love that brand of polish!! i need to get back into my gels. such a pretty color. Thanks girl, Kate Spade always nails it! I'm obsessed, I've used this gel polish pretty much non stop for the last I don't even know how long, 2 ish years?! It's the only way I don't rip my nails to pieces! Such a pretty snow picture. I agree - if it's going to be cold, there had better be snow! And I love how you have your nail polishes displayed. So pretty!! Thanks for linking up with us on H54F! Thanks for hosting! I figure with all the pretty colors, best have them out!